Welcome to the Best Western California City Inn & Suites! Proud to host those who serve, this California City hotel is a favorite for guests in town for Edwards Air Force Base, but we also cater to vacationers, truckers and business travelers. When guests are close to stunning recreational opportunities at Red Rock Canyon or can easily explore the beauty of the Mojave Desert, it instantly makes any trip that much better. Sports are big business in this part of the state, with motocross events at SOCAL OTMX bringing in competitors and fans from around the world. Whether it is hiking, business at the base or an adrenaline packed motocross event that is on the agenda, staying in comfort is crucial. New appliances in every room and a lavish pool to make guests feel at home. This California City hotel is renowned for cleanliness, but it is hospitality that really sets the bar high. Enjoy a fitness room on site to keep up with those workout regimens and a meeting room so you do not have to go far to close the deal. Slip away to the Desert Tortoise Preserve and get to know some real locals. Enjoy a golf tournament at one of the local courses or simply spend the day working on that swing. The nearby Silver Saddle Ranch and Club is a peek into the Wild West and entertainment for the whole family. Even business travelers with the Borax Mine and local correctional facility make time to enjoy everything Mother Nature has to offer. Truly get away from it all with a stay at this California City hotel. Construction and repair crews can take advantage of extended stay rates, and those with NASA or aerospace companies make the most of an escape from the hustle and bustle. Whether it is work bringing guests here for months or you are just passing through, make the most of your trip by staying in comfortable accommodations. 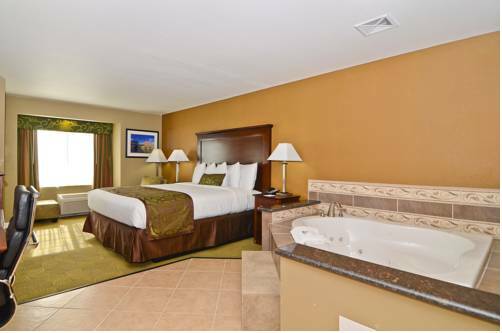 Reserve a quiet stay at the Best Western California City Inn & Suites for the best rates around! From: Mojave. Take 14N to California City, take California City Boulevard, turn right for five miles to center of city. Arrive at the Best Western California City Inn & Suites. From: Edwards Air Force Base. Take 58W to California City turn off, turn right and continue for eight miles to center of city. Arrive at the Best Western California City Inn & Suites. From: Los Angeles. Take 105S to 110N, then take 5N to 14N, follow this to California City Boulevard, turn right and continue to center of city. Arrive at the Best Western California City Inn & Suites. From: Ontario. Take 15N to 395N, then take 58W to California City turn off, turn right and follow to center of city. Arrive at the Best Western California City Inn & Suites. 48.70 mile(s) from Outback Steakhouse, full service, steak house, open for: lunch, dinner, Palmdale, CA. 48.70 mile(s) from Olive Garden, full service, Italian, open for: lunch, dinner, Palmdale, CA. 28.60 mile(s) from Pacino's Spaghetti, full service, Italian, open for: lunch, dinner, Tehachapi, CA. 14.20 mile(s) from Jack in the Box, fast food, American, open for: breakfast, lunch, dinner, Mojave, CA. 40.20 mile(s) from Thai Garden Restaurant, full service, Thai, open for: lunch, dinner, Lancaster, CA. 14.20 mile(s) from Mariah Country Inn, cafe, American, open for: breakfast, lunch, dinner, Mojave, CA. 48.70 mile(s) from Chili's, full service, American, open for: lunch, dinner, Palmdale, CA. 48.70 mile(s) from Red Lobster, full service, seafood, open for: lunch, dinner, Palmdale, CA. 28.60 mile(s) from Hungry Howie's Pizza, full service, Italian, open for: lunch, dinner, Tehachapi, CA. 28.60 mile(s) from Don Juan's, full service, Mexican, open for: lunch, dinner, Tehachapi, CA. 14.20 mile(s) from Kentucky Fried Chicken, fast food, American, open for: breakfast, lunch, dinner, Mojave, CA. 40.20 mile(s) from Bigtuna Japanese, full service, Japanese, open for: lunch, dinner, Lancaster, CA. 48.70 mile(s) from Applebee's, full service, American, open for: breakfast, lunch, dinner, Palmdale, CA. 48.70 mile(s) from International House of Pancakes, full service, American, open for: breakfast, lunch, dinner, Palmdale, CA. 14.20 mile(s) from Voyager Restaurant, full service, American, open for: breakfast, lunch, dinner, Mojave, CA. 28.60 mile(s) from Jake's Steakhouse, full service, steak house, open for: lunch, dinner, Tehachapi, CA. 48.70 mile(s) from Johnny Carino's, full service, Italian, open for: lunch, dinner, Palmdale, CA. Garden - 48.70 mile(s) from Olive Garden, full service, Italian, open for: lunch, dinner, Palmdale, CA. Two acres of desert chock full of hundreds of cactus/folk art sculptures, made from welded pipe and bottles by Elmer Long, who began in the 1980s. ~46 miles from California City. ~70 miles from California City. ~74 miles from California City.